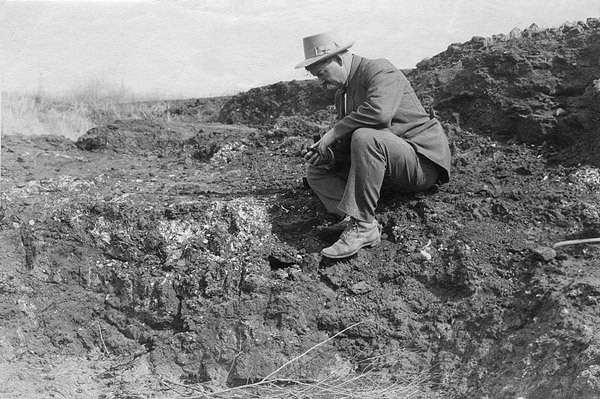 Born in 1869 in Hopkinton, Iowa, John C. Merriam started his paleontological career in the usual way, collecting the fossils found near his home — specifically, Paleozoic invertebrates. He received a bachelor’s degree from Lenox College in Iowa, and then came to the University of California to study geology and botany. As was usual for American scientists at the time, he finished his education in Europe, studying under the famous paleontologist Karl von Zittel in Munich. Returning to the United States in 1894, he joined the faculty of the University of California, teaching and carrying out research in both vertebrate and invertebrate paleontology. In 1912, he was appointed chairman of the newly formed Department of Paleontology on the Berkeley campus. He was appointed dean of the faculties in 1920, but that same year he left the University of California to accept the presidency of the Carnegie Institute of Washington. It was this that prompted the union of the Departments of Geology and Paleontology, which in turn spurred Merriam’s former pupil, Annie Alexander, to endow the Museum of Paleontology as a separate research institution. Most of Merriam’s original research in paleontology was carried out between 1900 and 1919. He made many contributions to knowledge of the vertebrate and invertebrate fossils of the West Coast. Perhaps his most famous contribution was his study of the vertebrate fossils from the La Brea tar pits near Los Angeles, California, started in 1912. He and his students, notably Chester Stock, described many of the vertebrates from La Brea, including the saber-toothed cat Smilodon californicus, which was later chosen as the California State Fossil. He also described other cats, wolves, bears, peccaries, camels, and many other vertebrates from La Brea; the picture on the right depicts him in the field at La Brea. Merriam and his colleagues also worked on other vertebrate fossils from southern California, Nevada, and Idaho, documenting a great many of the Cenozoic vertebrates of the American west. 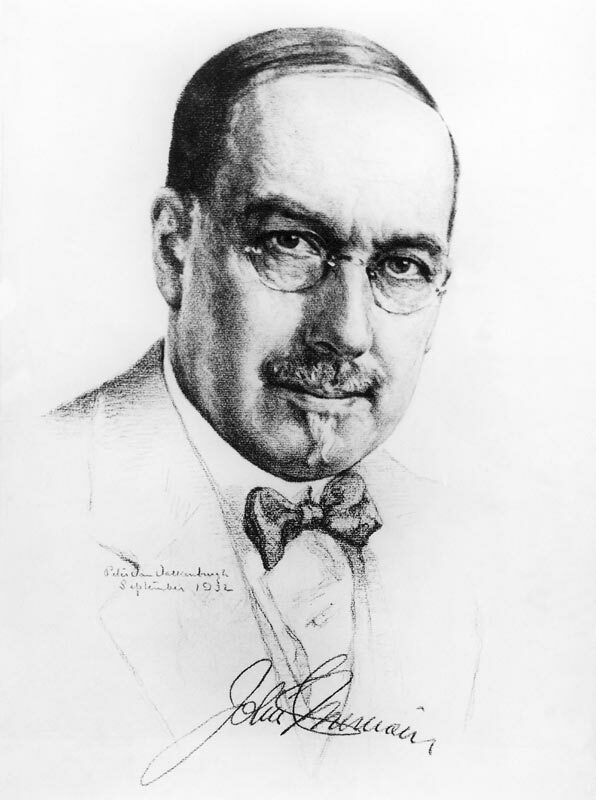 After 1920, Merriam’s output of original research decreased as his administrative duties expanded. However, he oversaw and encouraged paleontological research, established a seismological research program in conjunction with the California Institute of Technology, helped develop the educational features of the U.S. National Parks, became active in conservation issues of his time such as the preservation of the Pacific Coast redwoods, and accomplished many other things as president of the Carnegie Institute. During this time, and especially after his retirement as president in 1938, his interests turned to the place of science in human thought and human values. He expounded his philosophy of science in two books, The Living Past and The Garment of God, as well as in many articles and addresses. But there is reason to believe that of concepts in science arising from study of nature, there are none that would be considered to have influenced our belief more deeply than the generalized principles concerning development or evolution, reaching through vast ages in the story of the earth, and leading ultimately to advance in human life and institutions. As an outgrowth of the view of nature seen today…there is strong evidence that this vision of life development affecting us so deeply tends to transmute itself ultimately into emphasis on what we call progress…. As result of this situation one notes that in studying the universe widely in space, and deeply in time, out of our developing experience there tends to grow an attitude toward life that gives perspective instead of formless space, order in the place of aimless movement, confidence in the dependability of the universe and its laws, and faith that the world is so constructed as to maintain the trend of its development or evolutionary progress. Such an attitude towards this world and its meaning is enormously important to us when, as now, complicated dangers and evils seem almost to overwhelm us. The greatest value coming from our vision of change and time and their consequences is the idea that the world moves and that what we do is important for coming generations. This will be true whether we build for the future, or reduce our opportunity by degenerative or destructive pleasures which waste the store of materials that the past has accumulated. Merriam, J.C. 1943. The Garment of God: Influence of Nature in Human Experience. New York: Charles Scribner’s Sons. Originally created by Ben M. Waggoner, 1/9/96.